Back on October 19th, shortly after the BlackBerry Storm2 was announced, we ran a post on the blogs asking soon-to-be BlackBerry Storm2 owners what the first type of BlackBerry Storm2 accessory they would buy would be: some form protection, a hands-free accessory, charger, spare battery, etc. 70% of respondents to that poll voted that a cases for the BlackBerry Storm2 (or some other form of protection) be the first item they take care of (wow!). From there, it only makes sense that we follow up and find out exactly which type of offering be the most popular. These days there are many ways in which one can protect their BlackBerry model from scratches, bumps and drops, each offering their own pros and cons compared to the other. Invisible-type skins (Invisible Shields, BodyGuardz, Phantom Skins, etc.) preserve the look of the original smartphone and offer scratch resistance. Rubber skins (pictured above) provide additional shock protection and grip while hard form fit cases (ex. Innocase) add more bump proofing. Holsters provide power users with quick access to their Storm2, and take advantage of the unique in-holster / out-of-holster capabilities offered by the BlackBerry OS, as do BlackBerry-optimized leather cases and pocket pouches. And for those looking for the ultimate in BlackBerry Storm2 protection, Weather resistant cases like the durable OtterBox are a must-have. We want to hear what you plan to use to protect your BlackBerry Storm2. Keep in mind that with the launch of a new smartphone, it can take a few weeks or even months for manufacturers to get their cases built and ready for sale. 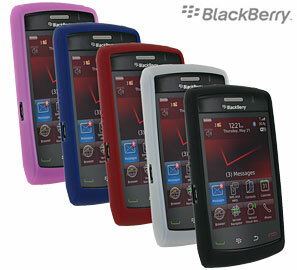 You'll want to keep it locked to our BlackBerry Storm2 cases page to see the latest offerings as they become available.